A rooftop air conditioner (or RTU) is the natural choice of systems for the large warehouses that line New York City’s outer boroughs. With no competition for rooftop space and only a single story to mount, warehouse owners default to the benefits of the RTU’s self-contained system. The retail industry is also served well by the rooftop air conditioner, especially big-box stores, malls and shopping centers. Stores located in lower Manhattan buildings of about 10 stories or less can take advantage of the RTU’s optimal large-space treatment, too. First, by employing the thermodynamics of cool air sinking, the rooftop air conditioner is able to service large spaces while expending a minimal amount of energy. This means lower electric bills year-round, and translates even further to an efficient and cost-effective maintenance process. In contrast to the more time-consuming diagnostics for systems that are spread throughout a building, an HVAC technician can go straight to the RTU and start the repair. If you are considering replacing your RTU, you’ll be relieved to hear that the process is not as daunting as you may think. Upgrading to a newer rooftop air conditioner is often an easy transition since the ductwork is already installed in the building. Taking this into consideration, shrewd business owners will view the replacement expenses as an investment. Your choice to have an HVAC expert evaluate your specific needs over defaulting to a one-size-fits-all plan can generate long-lasting rewards for your business. A knowledgeable contractor may consider, for example, the differential of temperature in a warehouse’s loading dock. By tailoring your new rooftop air conditioner to best serve your operations process, you’ll be positioning your business for increased success. Retailers interested in a rooftop air conditioner who are housed in the ground floors of high-rises will encounter challenges. The most obvious is the logistic obstacle of placing of the huge self-contained unit with limited rooftop space and access. The obstacle of the installation is followed by the dilemma of proper maintenance. Access to power outlets and water sources are crucial to RTU cleaning and repair, and lack of these resources on high-rise buildings proves a major hindrance. To complicate things further, plans for the extensive pipework needed to support RTUs in large NYC buildings often meet restrictions from historic landmark regulations. Due to these factors, retailers, restaurants and offices in Manhattan’s high-rise buildings tend to pass on the rooftop air conditioner, and opt for newer Variable Refrigerant Flow (VRF) systems instead. Restaurants in particular are attracted to its remarkably quiet operation and energy efficiency. Additionally, the VRF technology simultaneously calibrates heating and cooling. It even allows for control of isolated zones – which means the kitchen can be cooled while the dining room is heated. Speaking of kitchens, “What about treating negative air pressure?” is one of the top questions that restaurant owners ask when it comes to HVAC planning. Negative air pressure – the symptom of stuck doors and drafty dining rooms resulting from poor ventilation – is treated with a supplemental unit for creating what’s knows as “makeup air”. The catch? The supplemental unit of choice is often a rooftop air conditioner! Here is yet another example of why it’s important to have a knowledgeable HVAC contractor on your side. High-rise buildings of 30 stories or more, the homes of countless NYC offices, often operate with a “base” HVAC system. Base systems provide centralized air control for the entire building, and the mechanics of their equipment eliminate the rooftop air conditioner as an option for tenants. 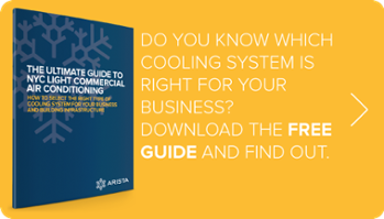 In these cases, businesses are left to select the design for distributing the central cooling that best suits the purpose of their space. What’s known as “water-cooled base systems” are the most common systems in high-rise buildings used primarily for office space, and careful forethought is well-spent in their air distribution designs. For instance, the base system servicing the employee workspace during work hours may not provide the 24/7 cooling required for the computer room. With all the options out there, you may be struggling to identify the right type of air conditioning system for your business. Here’s a resource that makes it easy to figure out what works best for different types of businesses and NYC spaces: The Ultimate Guide to NYC Light Commercial Air Conditioning. An Expert’s Help Can Bring Savings Through the Roof! Whether base system, VRF or RTU, regular maintenance is the key to avoiding expensive emergency repairs. Too often when poorly maintained systems break down unexpectedly, businesses that bring in the first available contractor are charged high prices for low-quality repairs. Another question to ask yourself: “What was the cost of revenue the last time a peak business day was interrupted by a faulty HVAC system?”. By including a yearly contract with a trusted contractor in your budget, you’ll be saving yourself from the red ink of that inconvenient repair.